DevaCurl No-Poo Zero Lather Cleansing Conditioner ($32 CDN/ 355 mLs): Please forgive the old packaging of my bottle; I had forgotten that I still had a quarter of a bottle left underneath my sink. I’ve been trying it out again and my feelings haven’t changed. I really like the minty citrus scent and the slip that co-wash leaves in my thirsty tangly hair. Unfortunately, this product tends to make my scalp itchy in ways that conditioner washing with straight conditioners do not. I expect that my scalp hates the peppermint oil, which is a known irritant and when my scalp starts to itch, I can easily start to have an eczema outbreak… I didn’t really find it any more cleansing than a standard conditioner and although my curls liked the slip of this product, I just couldn’t do it on more than an occasional basis. It also gave my fine hair limper roots, which I did not appreciate. Maui Moisture Curl Quench + Coconut Oil Conditioner ($10 CDN/ 385 mLs): Loosely speaking, this product is kind of sulfate, silicone and drying alcohol free. It does contain standard alcohol but as far as I am aware, it’s acting as a solvent in the formula. I’m not sure how I feel about this but I definitely did not experience any sort of dryness as a result. It has a thicker consistency that does impart some moisture but isn’t as intensely hydrating and as slippy as I would prefer. It was a fine conditioner but it wasn’t my favourite because of these shortcomings. It’ s a good affordable conditioner with aloe, glycerin, coconut oil and fatty alcohols. Unfortunately, I did not find it to be curl clumping either. I feel like it would be better for those with thicker hair textures and less tangly hair than mine. Shea Moisture Raw Shea & Cupuacu Frizz Defense Hair Masque ($16.99 CDN/ 354 mLs): I went an ordered this mask from Ulta because it was aimed at wavy hair – and I have waves with some curls thrown in there – and while I liked it, I wasn’t in love. It’s silicone-free, doesn’t have any drying ingredients and actually appears to be protein free. It had a thick texture that was smoothing and moisturizing but it didn’t do anything special for my finer strands. I think it would be better for thicker strands and those who are protein sensitive. Shea Moisture Mongongo & Hemp Seed Oils High Porosity Moisture-Seal Mask ($16.99 CDN/ 354 mLs): This has to be my favourite hair mask that I’ve ever tried and I liked this so much when I finished it – over a year ago – that I held onto the empty package like a true hoarder. It’s aimed at hair curlier than mine with higher porosity but I love it for my high porosity 2c fine hair. It has great slip and is super concentrated, providing intense moisture to my strands that help curls to clump, especially at the lengths. It has some protein in it too, which my hair appreciates but it’s very moisturizing overall and is very concentrated. The texture is rich but not heavy. I recently acquired a new tub and I’ve been loving having it in my life again. It’s silicone free and drying alcohol free. 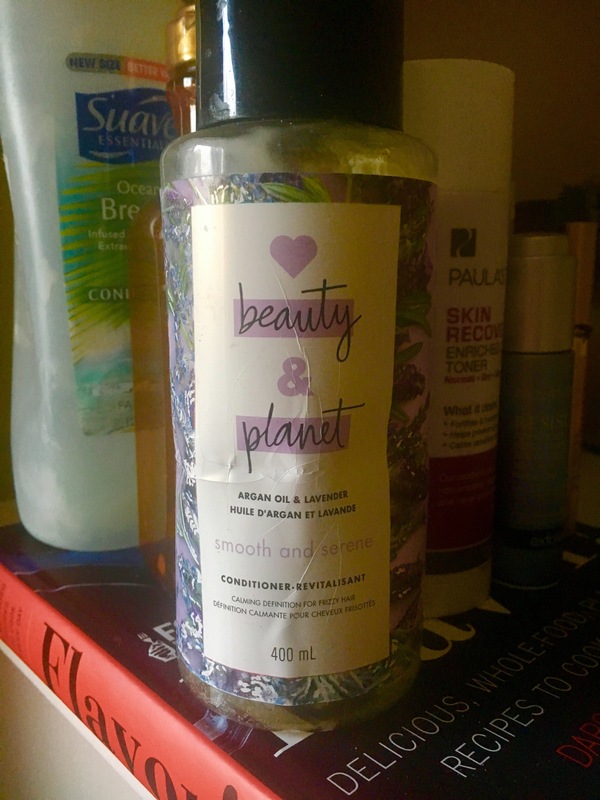 Love Beauty & Planet Argan Oil & Lavender Conditioner ($10-12 CDN/ 400 mL): This was an impulse purchase that I made upon seeing that the product was silicone free and seemed to have an interesting ingredient list. I really liked it. It’s silicone-free, has nothing drying in it and doesn’t really contain anything that could build up on the hair. It has a great spa scent, moderate moisture and great slip. It’s a great conditioner that hydrates without adding weight and contains fatty alcohols, your usual slip agents, along with coconut and argan oil. It helped to clump my curls and added no weight to my hair. It worked as a standard conditioner and as a leave-in. I would buy again, especially because of how easy it is to come across in stores here. Suave Essentials Ocean Breeze Conditioner ($2.77 CDN/ 887 mL): The Suave Essentials conditioners are one of those things that frustratingly aren’t readily available in Canada. However, I picked one up when ordering other products from Target online and I have to say that I was impressed with the light and thin conditioner. It’s silicone free and is mainly formulated with slip agents and moisturizing fatty alcohols. This makes it a great conditioner to use as a co-wash on my fine tangly hair and as a weightless leave-in conditioner. The thin runny texture is very curl clumping and leaves me with more volume than others. I’ll buy again when I place another order online. Paula’s Choice Skin Recovery Enriched Calming Toner ($21 US/ 190 mL): These milky toners from Paula’s Choice have been an essential part of my skincare routine for a few years now and I wouldn’t want to switch them out. They add another layer of weightless moisture and prevent transepidermal water loss. There’s loads of anti-irritants, antioxidants and hydrating ingredients and nothing known to be irritating. It’s essentially a serum in liquid form that’s very calming with the ability to help repair the barrier. Paula’s Choice RESIST Advanced Smoothing Treatment ($37 US/ 30 mLs): This 10% alpha hydroxy acid solution wasn’t an instant favourite but I grew to love the dual chemical exfoliant and serum enough to repurchase it, even before my bottle was empty. I find it to be an effective exfoliant and water-binder, with lactic, glycolic, malic, tartaric and salicylic acid – at effective concentrations – ,helping to smooth, brighten and even out my complexion. I find that the 0.5% of salicylic acid that the formula includes is enough to help prevent my skin from breaking out on my chin for the most part and I find the antioxidants and anti-irritants make the formula very easy to tolerate. NARS Pro-Prime Smudge Proof Eyeshadow Base ($33 CDN/ 7 mL): Despite having dry skin, I have somewhat oilier eyelids that are prone to creasing and wearing through eyeshadow in general. This is one of the few eyeshadow primers that I’ve tried that has consistently reduced the creasing I experience and increased the wear-time of eyeshadow. I’ve repurchased this. L’Oreal Voluminous Lash Paradise Mascara in Mystic Black ($13.99 CDN/ 8.5 mL): This dry volumizing formula has been a fantastic discovery in the last year or so. It’s so dry that it meets my standards for volume and curl without the risk of getting everywhere during application that wetter formulas have. It creates lots of drama in the lashes without being overly clumpy. My only complaint is that the tube gets grimy and the wand gets gunky earlier on than other mascaras so I find myself having to repurchase more often, which is probably a good thing for my eye health. I have repurchased and I will buy more soon.